1	3	Faith Like Potatoes DVD	In Stock - Order before 4pm for same day dispatchWant it on Wednesday 24 April? Facing and defeating outward hardship and destruction, as well as inward fear and anger, this moving life journey of a man who grows his faith - as unseen as potatoes, is captured and revealed in this 2 disk special edition DVD. Frank Rautenbach leads a strong cast as Angus Buchan, a Zambian farmer of Scottish heritage who leaves his farm in the midst of political unrest and racially-charged land reclaims and travels south with his family to start a better life in KwaZulu Natal, South Africa. With nothing more than a caravan on a patch of land, and help from his foreman, Simeon Bhengu, the Buchan family struggle to settle in a new country. Faced with ever-mounting challenges, hardships and personal turmoil, Angus quickly spirals down into a life consumed by anger, fear and destruction. Based on the inspiring true story by Angus Buchan, the book was adapted for the big screen by Regardt van den Bergh and weaves together the moving life journey of a man who, like his potatoes, grows his faith, unseen until the harvest. 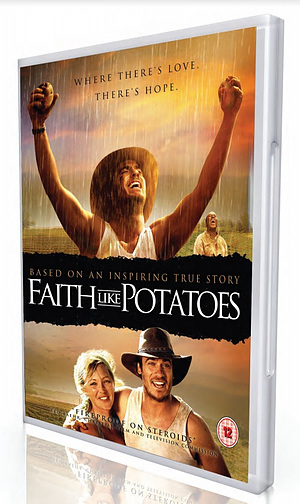 Faith Like Potatoes DVD by Angus Buchan was published by Global Creative Studios in September 2016 and is our 3661st best seller. The ISBN for Faith Like Potatoes DVD is 5060049640587. I'm really sorry to disagree with the previous reviewer but this has some of the worst acting I've ever seen. Very wooden which distracted my wife and I from the story. Which was a shame. I would definitely recommend the book though. If you want to see a quality movie by Christians then I would recommend To save a life followed by Fireproof and Facing the Giants. Got a question? No problem! Just click here to ask us about Faith Like Potatoes DVD.